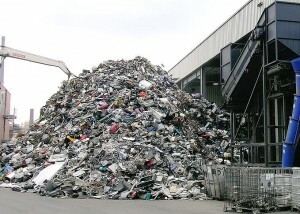 The world produces 1.8 billion electronic devices per year, and e-waste is expected to grow 8% annually…indefinitely. Photo: JosefLehmkuhl via Wikmedia Commons. With legions of North American smart phone users scrambling to replace their perfectly good devices with one of Apple’s shiny new iPhone models, it’s a good time to learn about Phonebloks. It’s a new design concept that could revolutionize mobile, drastically reduce e-waste—and, as a result, cut greenhouse gas (GHG) emissions right across the consumer electronics supply chain. Phonebloks is trying to bring together the capital, technology, and management expertise to redesign the mobile phone as a modular product. And they’re making smart use of social media to crowd-source public support for the concept, even before anyone begins crowd-funding product development. Phonebloks attacks a big flaw in the design of smart phones, tablets, and a long list of other devices—when a single component fails, it’s considered easier and cheaper to trash the entire unit, rather than fixing the problem. A generation ago, we called this planned obsolescence, and many of us hated it. Today, the neighbourhood repair shop is a thing of the past—for electronics, and even for small appliances. So we pay more, and more frequently, for new gear that contributes to a mounting e-waste crisis. With Phonebloks, if a component fails, you pop open the device and replace that piece, not the whole unit. The do-it-yourself design also opens the door for users to customize their phones, adding the features they need and buying them from the producers they prefer. If you do the math, that eight per cent annual increase means our e-waste is set to double every nine years. And quadruple every 18 years. Phonebloks’ focus is on e-waste. But along the way, the system may also point toward reductions in the energy that goes into producing and distributing electronic equipment. That makes Phonebloks a great example of what it will take to get at the underlying drivers of energy demand and GHG emissions. If you look at a cell phone as a finished, delivered product, its status as a piece of e-waste waiting to happen is its biggest environmental footprint. But if you think about the global supply chain behind 1.3 billion electronic devices per year, you begin to glimpse how much energy manufacturers could save by fundamentally redesigning the basic product. If Phonebloks works, the shell of the phone and most of the components will have a much longer lifespan. They’ll only have to be manufactured, shipped, sold, and disposed of once. Any pieces you replace will be smaller and lighter to produce and deliver. That means the electricity required for manufacturing, the Bunker C oil that carries finished product across the ocean, the fuel and electricity required for wholesaling and retailing, the Bunker C that probably transports the discarded product back across the sea for disposal—Phonebloks eliminates all of that energy use, and all the associated emissions. This is the kind of system change that Smarter Shift associate Ralph Torrie is thinking of when he talks about shifting the underlying patterns of demand for fuel and electricity. When Ralph and I worked together at the Trottier Energy Futures Project (TEFP), we reported that productivity improvements across the economy had done more to boost Canada’s energy security than all forms of new energy supply combined. But TEFP also identified supply chains and goods movement as one of the biggest challenges on the road to a low-carbon energy future. Phonebloks is one initiative that could help bring freight volumes under control, while supply chain and logistics managers try to sort out how to optimize their overall energy use. When I last checked their site, Phonebloks had generated 203,000 Facebook Likes, 26,000 repeats on Google+, and 23,200 Twitter tweets, adding up to a social reach of nearly 303 million—with 35 days still to run in their initial outreach campaign. That makes Phonebloks a great example of using social platforms to crowd-source a solution to a big issue like e-waste—or, as it turns out, an even bigger problem like climate change. The project is still in its earliest days. It’ll need the kind of steady, relentless, long-term campaign that becomes more collaborative with the right approach to content marketing, and more affordable with social media. But for those techniques to be worth deploying, a campaign has to start with smart ideas and sound arguments—none of which seems to be a problem for Phonebloks. It’ll be interesting to see how many thousands or millions of community voices it will take before a smart manufacturer seizes the opportunity. Thanks to Judy Kucharuk of Footprint Management Systems Inc. for the original pointer to Phonebloks.